You can use plain flour if you wish but wholemeal flour gives these muffins a rustic edge and extra fibre boost too. In a large bowl, sift flour, bicarbonate soda and baking powder. Add salt, sugar and white chocolate chips and mix through. In another bowl, whisk together yoghurt, Boysenberry Jam, egg and oil until well combined. Pour yoghurt jam mixture into the dry ingredients and fold or mix gently with a wooden spoon to mix well. Line a muffin tin with 10 patty cases. Scoop about ¼ cup of mixture into each case (we recommend using a spring-loaded ice cream scoop for ease). 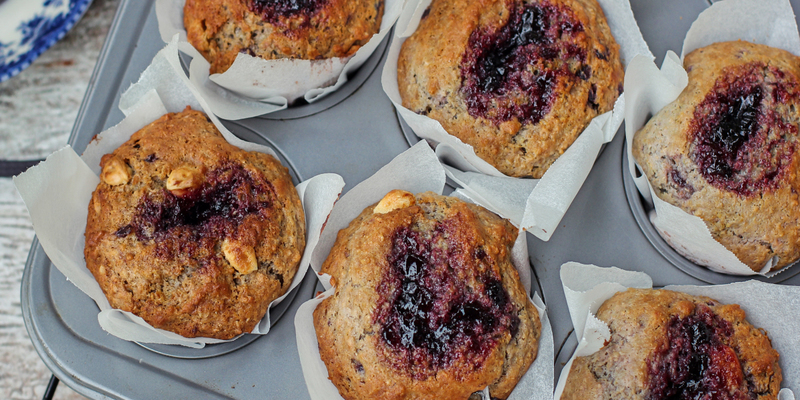 Top each muffin with a teaspoon of extra jam. Bake for 20-25 minutes. Remove from oven and cool on a wire rack slightly before serving.